Peterson, Jean. "Yarmouth". The Canadian Encyclopedia, 20 July 2016, Historica Canada. https://www.thecanadianencyclopedia.ca/en/article/yarmouth. Accessed 20 April 2019. Yarmouth, NS, incorporated as a town in 1890, population 6761 (2011c), 7162 (2006c). The Town of Yarmouth is located at the entrance to Yarmouth Harbour at the western tip of Nova Scotia and referred to as Eastern Canada's Gateway. Yarmouth, NS, incorporated as a town in 1890, population 6761 (2011c), 7162 (2006c). 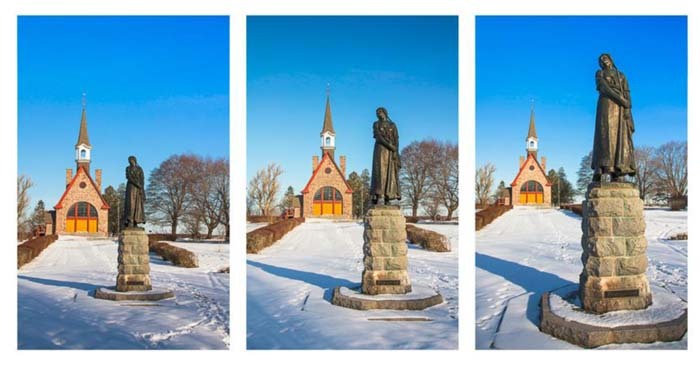 The Town of Yarmouth is located at the entrance to Yarmouth Harbour at the western tip of Nova Scotia and referred to as Eastern Canada's Gateway. Called Kespoowuit ("land's end") by the MI'Kmaq, and Port Fourchu by Samuel de Champlain, it was settled first by Acadians, later by settlers from New England (1761). 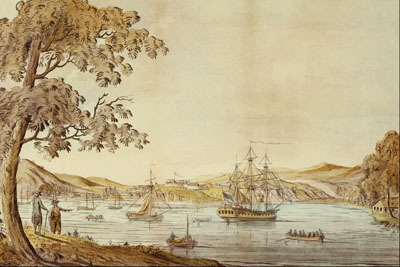 During the American Revolution settlers began to arrive from Massachusetts, the beginning of Loyalist immigration to Nova Scotia. 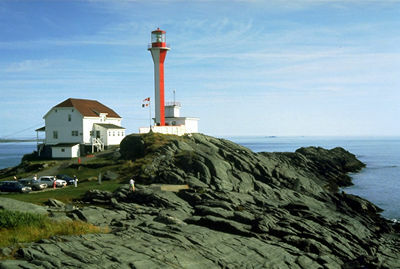 The Yarmouth Lighthouse perched atop Cape Forchu, Nova Scotia (Corel Professional Photos). 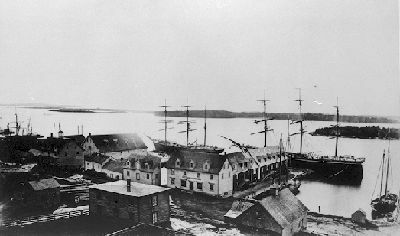 Yarmouth, Nova Scotia, prospered in the days of sail (courtesy Yarmouth County Historical Society). Settlement in the Chebogue area had by 1810 moved to Yarmouth, which became the administrative and commercial centre. The shipbuilding industry, which began about 1764, had by the 19th century expanded into an impressive merchant fleet. By 1879 Yarmouth reached its peak as a shipbuilding port, being the second-largest port of registry, in tonnage, in Canada. Its proximity to New England and rich fishing grounds also contributed to the town's development. Yarmouth's location and port also allowed the town to be a centre for rum running during Prohibition in the 1920 and early 1930s. During World War II it was the site of a military base. Today the economy of the town is based largely on fishing and fish processing, but it has suffered with the decline in the groundfish fishery. The Lobster, Scallop and Herring fisheries have provided some stability in this sector. Its manufacturing sector includes ambulances, knitted goods and wood products. The first township in Nova Scotia to introduce municipal incorporation (1856), Yarmouth was reincorporated in 1890 after repeal in 1858. As well as being the commercial and industrial centre of southwestern Nova Scotia, Yarmouth is also its transportation centre, with ferry service to Bar Harbor and Portland, Maine. The US ferry connections also make Yarmouth a major port of entry for tourists. Artifacts held by the Yarmouth County Museum and Archives serve as reminders of the days when it was a major seaport. Pelton-Fuller House is a late Victorian home furnished to the period. YarmouthThe official website for the Town of Yarmouth, NS.